PALM SPRINGS, Calif. - March 15, 2019 - PRLog -- Calico Cooper will be a featured guest on The Jimmy Star Show live radio/tv show hosted by King of Cool Jimmy Star along with Cool Man About Town Ron Russell to discuss her career and the entertainment industries at large. The Jimmy Star Show is tv/radio's coolest hit show, featuring the best in music, entertainment, fashion and pop culture, all from a fun industry insider perspective in a completely live, unedited fast-paced two-hour conversational format. Calico Cooper, daughter of shock rock legend Alice Cooper is an American Tv and Film actress. Famous for portraying Alice's Nightmarish muses on his world tours, she diversified in 2005 and began a career in film and television. She has appeared in shows such as Hawaii 5.0, Henry Danger, and The Mindy Project. Cooper and Fellow Alice band mate Chuck Garric combined forces in 2012 to create the high octane fueled band "Beasto Blanco". They are currently touring America and Canada with the mega band Halestorm and will appear alongside Megadeath on their "MEGACRUISE". Voted one of Maxim's "20 hottest rock star daughters." Cooper is a resident of Los Angeles and works closely with the Downtown Women's Center to which she volunteers her time. Important to note that Calico joined Beasto Blanco shortly after it was created by Chris Latham and Chuck Garric. 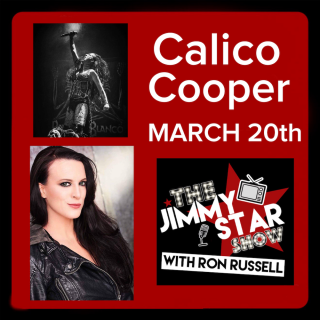 The Jimmy Star Show with Ron Russell is pleased to showcase the expertise and talent of Calico Cooper and all anticipate a fun and informative time talking with her about her career and the entertainment industries at large. To hear/see Calico Cooper live on the Jimmy Star Show with Ron Russell tune in to W4CY radio on Wednesday March 20th, 2019 from 3-5 pm ET and 12-2 pm PT online at www.w4cy.com from anywhere in the world! Apple Podcasts and many more!